InTRO’s initial charge included both institutional research and faculty service; to that end, in 2014-15 we conducted an inventory of technology services across campus, while simultaneously providing referral services for faculty with complex instructional technology needs. Along the way, we collected a wide variety of additional information, including gaps in current services and prevalent attitudes about technology and learning amongst multiple local constituencies. We also collected some excellent examples of technology-enhanced pedagogical innovation already in progress at UO; you can read about these in further depth in Inspired Examples. Through the process of meeting with service providers across campus, which informed the Instructional Technology inventory below, InTRO identified a number of significant educational technology functions supported by multiple campus units. These include classroom technology, help desk support, multimedia services and production, instructional design, teaching innovation and pedagogical support. 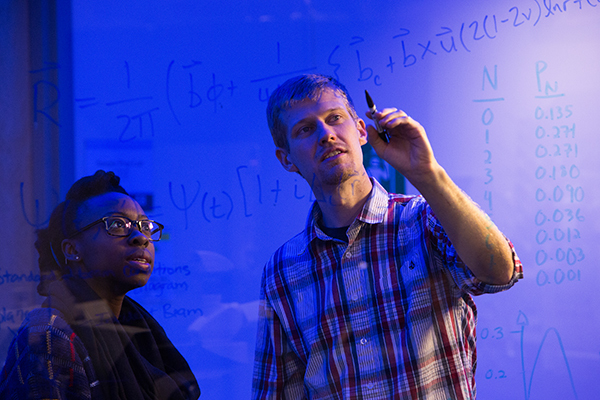 Click here to read more about some of the significant functions currently supported at UO. In addition to a broad overview of services provided, the inventory of campus technology service units sought not only the scope of their current services but their goals and visions for the future. 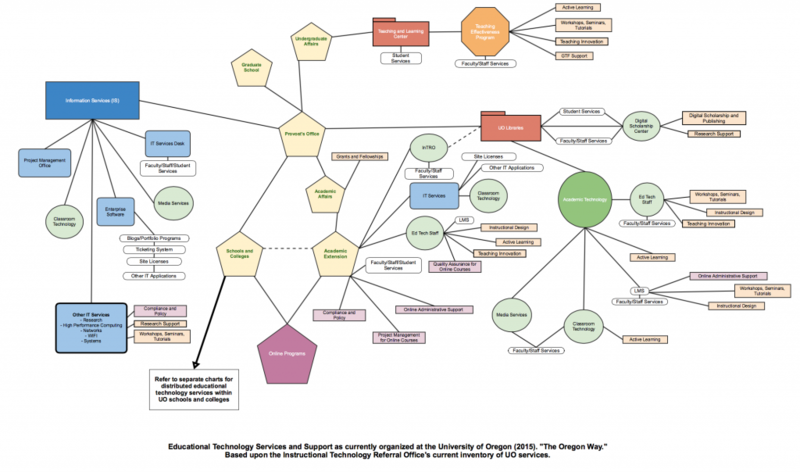 Click here to read more about each of the University of Oregon’s technology service providers. InTRO’s referral process was designed with a holistic perspective, taking the needs, resources, and vocabulary of both UO faculty and technology staff into account, utilizing the benefits of dedicated time and focus available to InTRO staff to investigate options. The result was a flexible procedure that directed faculty not only to instructional technology services across campus, but to related offices as appropriate. Referral Circuit Diagram: A map of the connections InTRO made between faculty and service units, 2014-15. Click to enlarge. Altogether, InTRO coordinated 28 referral projects from August 2014 through May 2015. Twelve referral projects were referred out and completed satisfactorily. Eleven more were referred out to service providers and most likely concluded successfully, but final status information was not available after InTRO’s involvement ended. Three projects stalled: one because requested service was not available; two others because the projects require additional resources and/or project management to proceed. Two further projects are inactive, waiting on client decision to reopen or take action. Click here to learn more about InTRO’s referrals for 2014-15. UO faculty participated in the annual ECAR survey on technology for the first time in AY 2014-15. Take an early peek at a recent survey of UO faculty opinions about technology! The University of Oregon participated in the EDUCAUSE Center for Analysis and Research (ECAR) 2015 Survey on Faculty and Information Technology for the first time this past spring. A summary and analysis of national and local data from ECAR will be provided in a report later in 2015, but raw data for each of the survey questions has been made available. We’ve pulled some highlights. Click here to learn more about current UO faculty perspectives on technology and learning. When asked to describe the current state of instructional technology at their institution, these were the most popular terms chosen by UO respondents. Throughout the year, technology staff from across the University of Oregon have generously shared their observations and assessments of our local landscape. In addition to conducting numerous small group conversations, InTRO informally surveyed staff who prepare faculty to teach online, soliciting opinions on best practices and institutional priorities. We also helped facilitate the first get-together of the new UO Educational Technology Community of Practice, collecting additional qualitative data through an icebreaker activity at that luncheon. Click here to read more about the perspectives of UO technology staff.